Some things just flat creep me out. We have a stand of sumac growing, and I hate it. It just looks like oversized weeds to me and it pops up everywhere, so I'm constantly pulling small ones out of the ground. Supposedly poisonous, the cattle use it for shade but don't really eat it. 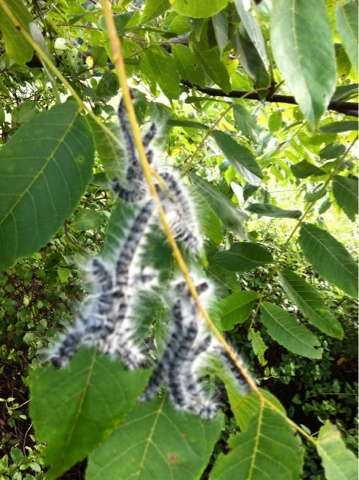 These caterpillars appeared today. And are eating the sumac like it is candy. Go little caterpillar go! And those long spikes on the caterpillar? 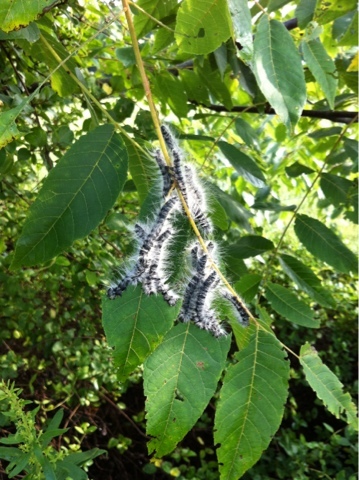 Probably will irritate your skin, as will any spikey looking caterpillar. Eat away at those plants!